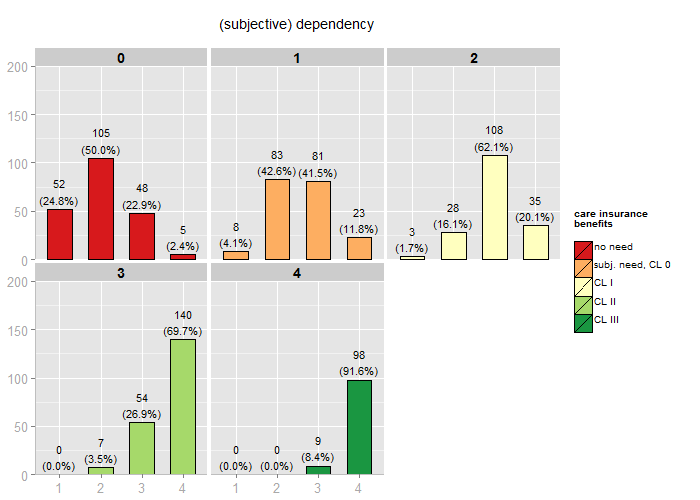 Easily plotting grouped bars with ggplot #rstats – Strenge Jacke! Grouped bars with different color palette, category and legend labels and diagram title. As you can see above, category labels can be passed as parameter, typically a vector of char values. If you have used my script to import data from SPSS, you simply access the category labels with efc_labels[['--variablename--']]. The variable names are saved in efc_vars. Furthermore, you can see that the bar colors have changed. You can either use your own color values, gs for a greyscale, or use brewer in combination with colorPalette to use any of the pre-defined color brewer palettes supported by ggplot. You find further information in the documentation of the R script. Dot plot with different color palette, no percentage values shown. To avoid overlapping, you can see the dodged position of the dots in the graph above. Since this may make it harder to define which dot belongs to which group, shaded rectangles surrounding each group are plotted by default. You can, of course, switch them off as well. 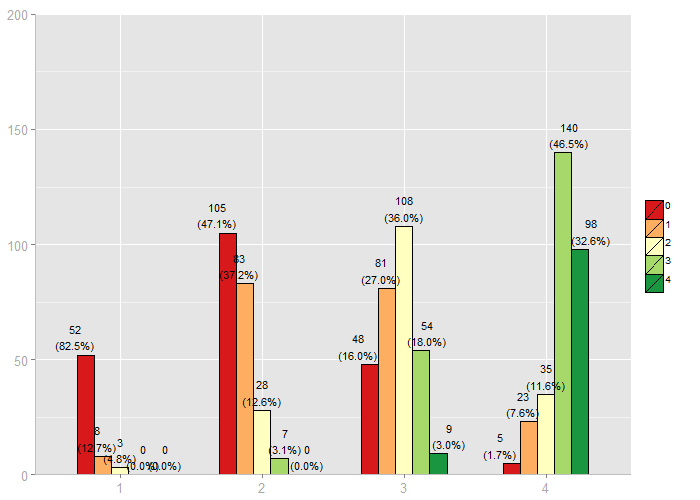 Stacked group bar chart, with default color palette and fixed upper y-axis limit. If you like, you can also display each category in a single diagram using facet grids. Please notice that facet grids calculate category percentages, i.e. each category sums up to 100%, while the other plots use group percentages, i.e. each groups sums up to 100%! Facet grid with one diagram per group, each diagram representing one category. This example should demonstrate how dots in a facet grid may look like. Facet grid with dot plots, using grid title instead of legend. As you can see, I have replaced the factor values of the grouping varible (which were „0“, „1“, „2“ etc.) with the related category or factor labels. This can easily be performed with the convertToLabel function, which is also included in the sjImportSPSS script. By this, the group variable now contains „CL 1“ or „CL 2“ as values instead of „1“ or „2“. This makes it possible to plot the group titles into each facet, which makes the legend needles. In this case, I would recommend removing the legend, because the facets are ordered in alphabetical way, while the legend is not. This may lead to differences between legend colors and facet colors. And finally, three examples for plotting distributions of metric scales, e.g. age. First, a grouped histogram chart, with mean intercept lines for each group. 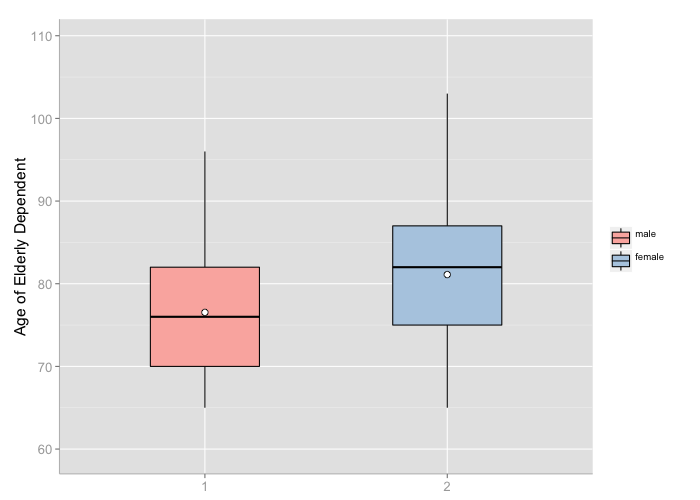 If you wish, you can also display box plots for each groups. The groups‘ mean value is displayed as white point inside the box. Or, if you don’t want to lose information on the distribution, you may want to use violin plots. These are „mirrored“ denstity curves for each group. Additionally, a small box plot is plotted inside the violins. 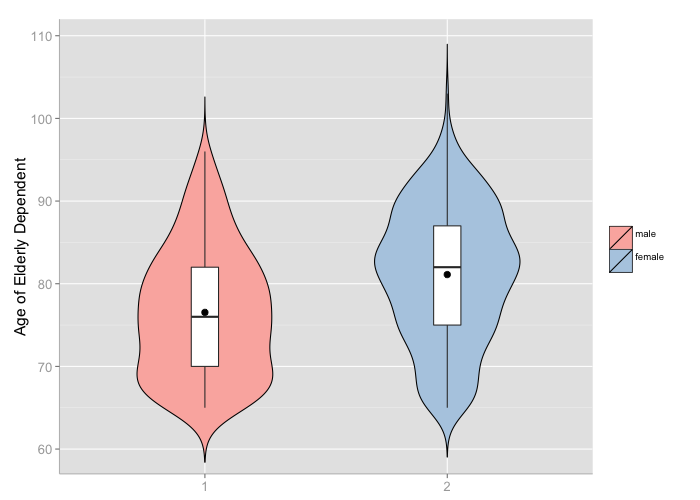 Violin plot with small box plot inside. Mean value is indicates by the black point. You can, of course, change many more parameters. A complete overview with short information on each parameter is in the documentation inside the R script. Cylinders France Germany Italy Japan Sweden U.S. The first barplot is stacked bars, the second one is bars beside each other. Well, it’s not that complicated, actually. ggplot offers quick plots „on the fly“ as well which give the same result, so there’s no difference between „standard“ plotting functions and ggplot. 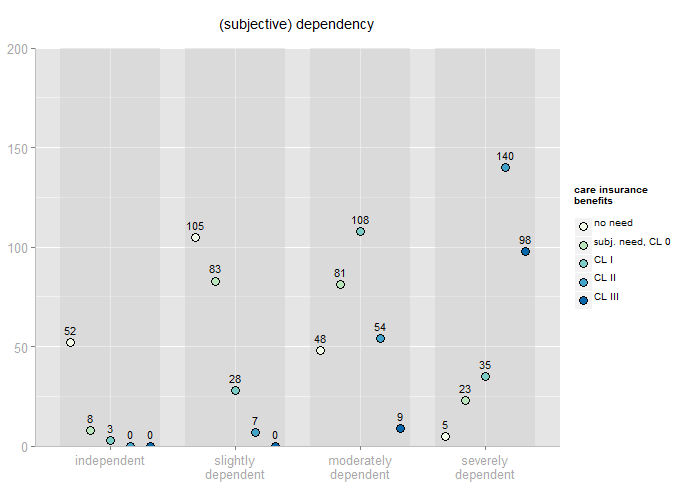 ggplot, however, becomes strong when it goes into detail in graphs‘ appearance. That’s where ggplot starts looking complicated. But: If you want more graph manipulation with the standard functions, it looks complicated as well: Let’s say you want to add lines or values to the bar plot, you have to use further commands to get the wanted result. An example for plotting VIF-values (Variance Inflation Factors) as bar charts to check multi-colinearity of a linear regression’s predictors. 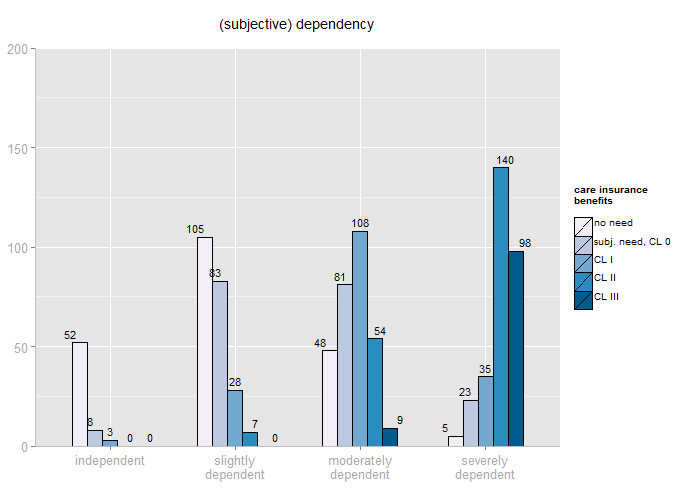 This bar chart should include the value labels and horizontal lines that indicate the acceptable limits for the VIF-values. Now the standard bar plot becomes looking more complicated, too. # character in the current user coordinate system. 2.) I have to deal with all arguments passed as parameters to create the ggplot-object. 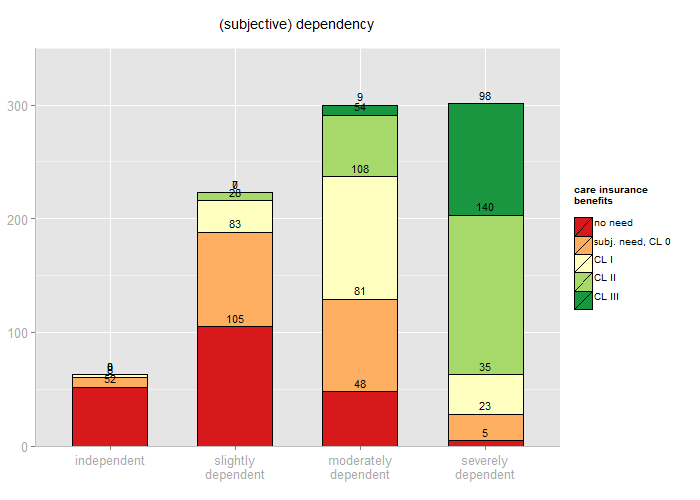 If you would just use „fix“ values, you can shorten the ggplot-term a lot. 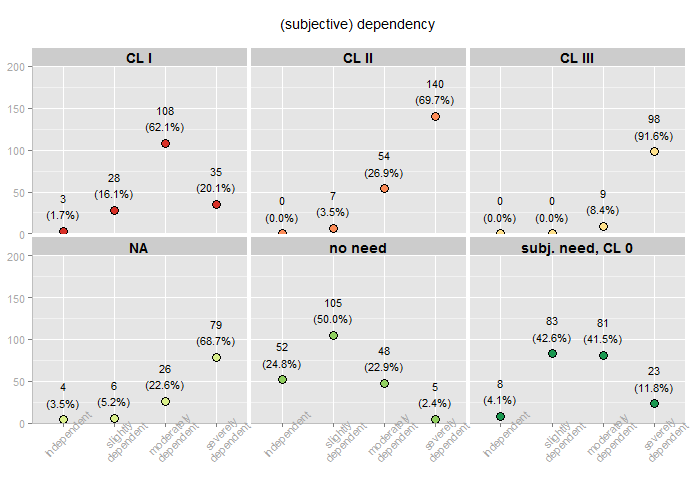 Still, it seems to me that ggplot is, at least at the beginning, a bit more complicated. But once you know how it works, it gives you many options to manipulate your graphical output – which is one of the main reasons I started learning R and ggplot as well. The results you get with ggplot go beyond from what is possible with the basic plotting functions, that’s at least my impression. That’s a good answer. The examples that I have seen with ggplot have used (many) options, but there is no need to use them at first. I looked at your example with VIFs, and that looked less complicated to me, but I realized that this was because I know about the options to „plot“. In terms of complexity of code, it is about the same as your ggplot (which accomplishes more). I have seen a lot of people using ggplot, so that it does seem worth learning. As with anything new, there is a „learning curve“ that has to be climbed. Ich wollte diese Antwort auf Deutsch schreiben, aber ich habe es realiziert, dass meine Deutsch zu schwach ist! Pingback: Plotting lm and glm models with ggplot #rstats | Strenge Jacke! 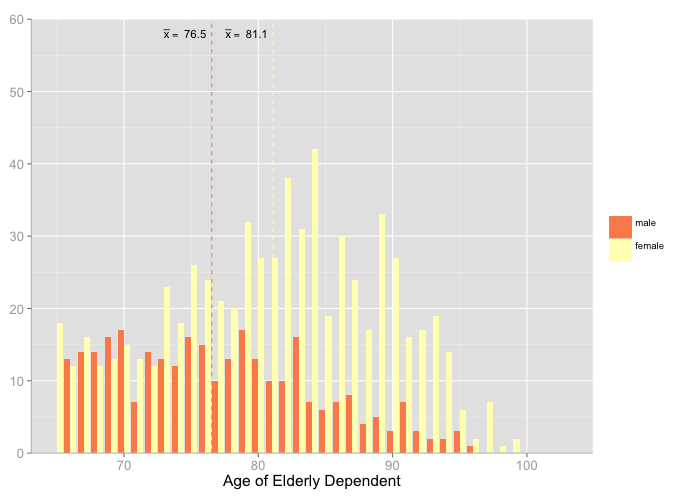 could you maybe post your dataset, or provide an example with a standard dataset from R.
I’m trying to reproduce the first plot but I’m having a hard time because I don’t have your data and I don’t know exactly how the input data should be formatted. (the sector-variable has no label and variable values in the SPSS-data set, so the title- and categoryLabel parameter have no influence here). Pingback: Getting the data for the sjPlotting-functions into shape #rstats | Strenge Jacke! Pingback: Examples for sjPlotting functions, including correlations and proportional tables with ggplot #rstats | Strenge Jacke!